The conflict between Azerbaijan and Armenia over Nagorno-Karabakh, a breakaway territory of Azerbaijan, has continued for more than 20 years. The conflict began in 1987 and escalated to a period of undeclared war between 1992 and 1994. In 1994, the two countries reached a cease-fire agreement but did not agree on a political resolution to the conflict. Both sides constantly break the cease-fire through the use of light weapons. The military conflict, characterized by violence against civilians and “ethnic cleansing”, resulted in the injury, death, or disappearance of thousands of people. Armenian forces occupied 20 percent of the territory of Azerbaijan. Military actions destroyed whole territories. Ethnic Azeris fled Armenia, ethnic Armenians fled Azerbaijan, and ethnic Azeris fled Karabakh, thus becoming refugees or “internally displaced persons” (IDPs). According to Azerbaijani government data, around 250,000 Azeris fled Armenia and took refuge in Azerbaijan between 1988 and 1992. The Azerbaijani State Committee on Refugees and IDPs Issues reported that about 700,000 people were internally displaced because of the conflict. The United Nations High Commissioner on Refugees cites the number of IDPs in Azerbaijan as 603,300. The government, in certain steps to improve the living conditions of refugees and IDPs, adopted relevant state programs and legislative acts. Refugees from Armenia have been granted Azerbaijani citizenship and now enjoy the same rights and opportunities as other Azerbaijani citizens. In contrast, the situation of IDPs is worse. They often live in poor conditions and see returning home as the only way to achieve better lives. For a long time, the Azerbaijani government avoided promoting the full integration of IDPs into society because it believed such a policy could be interpreted by general public as a sign that Azerbaijan was giving up on regaining Karabakh. Starting in 2001, the government began to close down IDP camps and move IDPs to specially-built settlements. According to government data from the period from 2001 to 2008, around 17,000 houses were built to accommodate IDPs. Over $1-billion U.S. Dollars will have been invested in further resettlement by 2011. However, government-provided accommodation reportedly cannot meet the needs of IDPs because the structures are located in areas with no access to needed infrastructure such as schools, medical centres, and community facilities. The areas also lack opportunities for employment. Because some of the houses are situated near occupied territories near the Armenian border, some IDPs also feel the threat of physical insecurity. 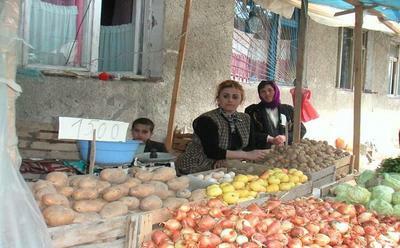 In today's Azerbaijan, being an IDP does not necessarily equate to being poor or disadvantaged. Many IDPs have been able to achieve good living standards and another, even smaller percentage occupies high ranks in Azerbaijani society. All the same, there is great poverty among IDPs, especially in the urban context, and IDPs sometimes inhabit ghetto communities that are physically and socially segregated from the majority population. Many IDPs still live in inadequate facilities such as hostels, camps, schools, and unfinished buildings. A report prepared by the Internal Displacement Monitoring Centre and Norwegian Refugee Council states that 30 percent of IDPs in Azerbaijan live in collective accommodation. Housing discomforts and perils render life difficult for IDPs, who are often also dealing with trauma from the experience of war and displacement. IDPs often complain about neuroses associated with the difficulties of daily life and the sorrow of having lost relatives during the war. Many IDPs report suffering from chronic illness caused by damp floors and cesspool fumes. A great number of families occupy dormitories, originally designed to host university students, where entire families live together in single rooms without any privacy. Although room interiors are kept very clean and are often carefully modified for purposes of aesthetics and comfort, the situation of common spaces and facilities is totally different. Sewage overflows, seriously decayed buildings, and lack of any trash collection are part of the norm in most settlements. The continuing trauma of this situation, effecting people already torn by tragedies of war and displacement, often goes unrecognised or challenged. It is enough to pay a short visit to the IDP community in Baku's suburban Binagadi district to witness one of the worst examples of IDP living situations. Here, for more than 15 years, hundreds of families have occupied several unfinished concrete block buildings where they have built brick or stone interior walls to create partitions and rooms. Even if, thanks to the care of the occupants, the interiors of the rooms often appear tidy and perhaps even comfortable, the other parts of the buildings without walls or railings offer startling views. Although state programmes have confronted the situation in recent years, testimony from IDPs reveals that the gap between official rhetoric and real, concrete steps towards improving the lives of IDPs is still wide. In some ways, local communities are sympathetic to the difficult experiences of IDPs, but since many people in the country struggle with social and economic problems themselves, including lack of employment, low standards of living, and corruption, refugees and IDPs rouse a certain resentment among locals. Refugees from Armenia are stereotypically considered a rich “clan” of people who hold high positions. Because most of the refugees and IDPs came from rural areas, their settlement in cities and towns created a clash between their lifestyle and that of the local urban culture. More serious controversies between refugees/IDPs and locals revolve around property rights of structures occupied by IDPs. Around 70,000 IDPs in Azerbaijan live in dwellings officially owned by other private persons. According to a presidential decree, IDPs cannot be evicted from their places of residence. It used to be common practice that domestic courts who heard property owners' complaints against IDPs confirmed the owners’ property title, but ruled that eviction of IDPs must “be postponed until the occupied territories are liberated”. But the European Court of Human Rights, in the case Akimova v. Azerbaijan, found this practice to be in violation of the 'right to property.' After the Akimova judgement, the domestic courts' practice changed to certain extent but did not resolve the tension between locals and IDPs. Court decisions on eviction still cannot be executed “until IDPs are provided with alternative accommodation”. The new practice leaves both parties unsatisfied because owners are usually frustrated by the uncertainty of not knowing when the court decision will be implemented, and IDPs are usually not happy with the offered alternative accommodation. Resolving the Karabakh conflict and the subsequent return of IDPs are critical to the government’s policy, but ensuring the right of IDPs to decent living conditions should also be a governmental priority.